You can now get the Tata Tiago with an AMT transmission. But should you? Let’s conduct a small experiment to find out. We could put it down to the crazy amount of traffic these days, and the human race getting a bit lazier, that automatics are becoming widely popular with the masses. Automated Manual Transmission (AMT) are much simpler when compared to other automatic transmission technologies and this has made two-pedal tech so much more accessible. In theory, the Tata Tiago AMT should be easier to drive in the city, while trading a bit of the refinement expected from an automatic transmission-equipped vehicle. To put this theory to the test, we drove the petrol-powered Tiago AMT in peak city traffic and then on some twisties to end the journey on top of a hill. Does the little Tiago sail through it all? Let's get going. The Tiago's 1.2-litre petrol is a refined and friendly engine, but it isn’t particularly punchy. The three-cylinder engine makes its 85PS of peak power right at the 6000rpm redline. What keeps it from becoming a hassle in the city is that the 114Nm of torque is produced midway at 3,500rpm and there’s plenty available at lower revs. This means that you keep picking up speed in a linear manner. But, and here’s the big but, this is something you won’t realise at first. And that is because of the AMT gearbox. Let me explain. The Tiago’s AMT let’s you choose between three modes - City, Sport and Manual. Left to do its own thinking in the city, the AMT feels rather laidback. It is eager to shift up gears, no doubt in the interest of fuel efficiency. If you decide to drive at a pace, anything faster than leisurely, the two-pedal Tiago takes some getting used to. In this case you’d be second guessing as to when the gearbox might upshift. Trying to leapfrog a slow moving car in traffic becomes an exciting event. You will have to stomp on the accelerator and force the gearbox to hold the revs up to the redline. If you don’t, the gearbox has a knack of upshifting right in the middle of an overtake maneuver. The engine can pull nicely to higher revolutions (as we later tried with the manual mode) but the transmission (in Auto) just doesn’t let it. The Sports mode holds revs till about 3,000 rpm while cruising (about 1,000 revolutions higher than the City) and partially helps in traffic. But on the whole, it fails to make much of a difference. This Sports mode hits 6,000rpm when you floor the pedal, whereas the City mode cuts off at 5,000rpm. Imperfect? Yes. Usable? Yes again. The gearbox logic, the gearing, and the heavy kerb weight make life difficult for the Tigor in its AMT guise. However, there are two ways you can still make use of this automatic package. Firstly, if you give up your eagerness and adapt to the car's 'chilled out' style, it becomes a very comfortable drive. The shifts are smooth and there is a very little 'head nod' during upshifts. And though the upshifts are a little slow, the downshifts are quick and not jerky. While coming back from our test, we let the transmission dictate the pace and the drive became surprisingly comfortable. Driving like this got us efficiency numbers of 16.04kmpl inside the city and 22.04kmpl on the highway. The second workaround is to use the Manual mode. As you would expect, you can upshift manually with a short push of the lever, but it still saves you from the hassle of repeated conventional clutch usage. It lets you pull the revs all the way to the redline (6,000rpm) and then shifts automatically to the next gear. The quick downshifts and the rev-happy engine help get a quick move on in traffic and in this mode, the car pulled a 0-100kmph time of 16.31 seconds. It doesn't take long on our road conditions to realise that the Tiago's suspension is set up on the stiffer side. Going over bumps at slow speeds doesn't unsettle the cabin but a sharp pothole or short speedbreaker will be felt. Increase speeds and the feedback from the road becomes all the more aggressive, with undulations being felt inside. You will have to go slowly over bumps and broken roads to keep the occupants comfortable. The steering feels light in the city and lets you easily cut through traffic. In fact, with this being automatic, you can really focus on the road and get through tight spaces without worrying about changing gears. But on the highways, the steering doesn't really weigh up much and you don't feel too connected to the road. The brakes engage after about half the pedal's travel, but once they do, the bite and feedback are good and gives confidence even under emergency conditions. In our test, the car came to rest from 100kmph in 46.36metres, while coming to a stop from 80kmph took 29.06metres, which is impressive. After navigating through traffic and some highway roads, we finally hit some twisty roads. The ideal choice for this part of the test was the manual mode. This where the car's stiff suspension and the smooth revving nature come together to put a smile on your face. The engine does not have spikes of power which works to your advantage. You can push the car into corners confidently with the stiffer springs helping you come out on the other side tyres squealing. One thing you now notice is that the engine makes a very sweet note. It immediately made us mute the 8-speaker system and get the windows down. Also a neat feature, the tachometer needle turns red when you hit the limiter and that looks pretty damn cool. Up till now I though the 'Sunburst Orange' was my favourite. But the moment I saw the red Tiago, it was fascination all over again. 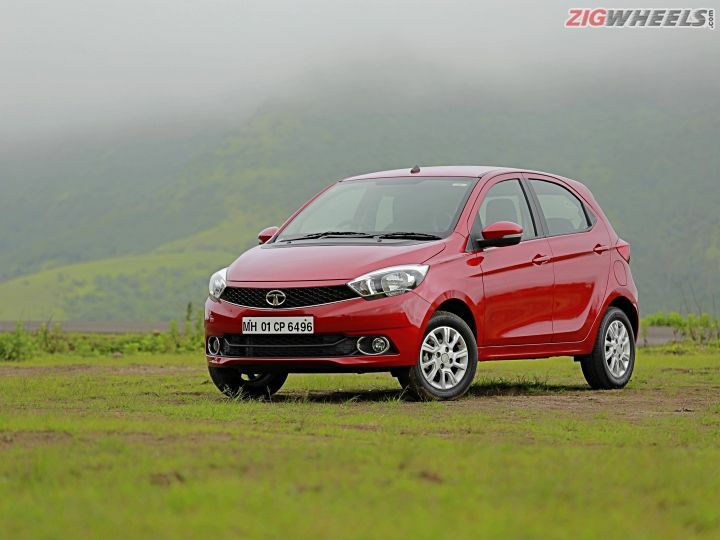 From the outside, it is Tata's, and arguably the segment's, best-looking hatchback. In the red and especially from the back, you can almost mistake it for a European hot hatch. The front grabs attention with the gloss-black grille which sweeps into the headlamps and the side proportions are just perfect. Overall, the Tiago is a stylish looking hatchback with a lot of visual appeal. Can one differentiate the automatic from a manual from the outside? Well yes, but you will have to focus on the additional alphabet (A) on the boot's variant badging. The automatic is available with the top two variants. We had the top-end Tiago XZA which means the car had all the bells and whistles that Tata has to offer. In addition to the XTA, it gets LED indicators on the ORVM, alloy wheels(175/65 R14), front fog lamps, steering-mounted controls, rear wiper and defogger, and anti-lock brakes with EBD. As soon as you get in, you are greeted by a dual-tone black-grey cabin which isn't trying to act premium or sophisticated. Though the plastics used are hard and noisy, the pattern and the colour make it not only palatable but neat looking as well. Fair warning, the plastics start to rattle on bad roads. The next thing you notice is the automatic transmission. The lever has a rubbery coating in the middle and the chunky unit is quite comfortable to hold and shift. Everything else is exactly the same as the standard Tiago top variant. Ergonomically, the Tiago is pretty sorted. You get call, audio and voice command controls on the steering, one-touch-down driver's window, internally adjustable ORVMs and a manual AC, which make controlling these elements while driving fairly easy. More so, getting into a comfortable driving position is simple with height-adjustable driver seat and rake-adjustable steering. All other aspects of the Tiago are similar to the manual variant. You can check them out in our first drive review here. The IRVM is a little small and you have to constantly refer to the ORVMs to get a clear idea of the traffic situation behind you. The other issue is with the dead pedal. With the clutch pedal now gone, your left foot will feel the need for a more generous dead pedal. The dharma of an automatic transmission is to make daily city commutes hassle-free. The Tiago's AMT fulfils its duty but in an unyielding manner and dictates the way it should be driven, forcing you to adapt to its calm and composed style. If you can do that, the smooth shifts make it a breeze to drive. But if you are in a hurry, a simple flick will put it in manual mode and turn the lazy Tiago AMT into a fun to drive hatchback. The petrol engine, looks and features are indeed 'Fantastico' but things like the rattling plastics, stiff ride and the fact that you might end up driving in Manual mode after specifically buying an automatic, dampen the experience. The Automatic XZA variant is priced at Rs 5.25 lakh (ex-showroom, Delhi). This means you will be paying about Rs 33,000 over the equivalent manual variant and that makes it seem like good value. So the Tiago’s AMT box will cut out a lot of the stress in driving in bumper to bumper traffic, but the price is using some elbow grease. While there are better automatic options, it is the design, features and pricing that make the Tiago seem like the more appealing option. Question is, are you willing to work a bit for it?